Scout Ltd designed the Symbols of welcome for the festival, which RARA built and installed. 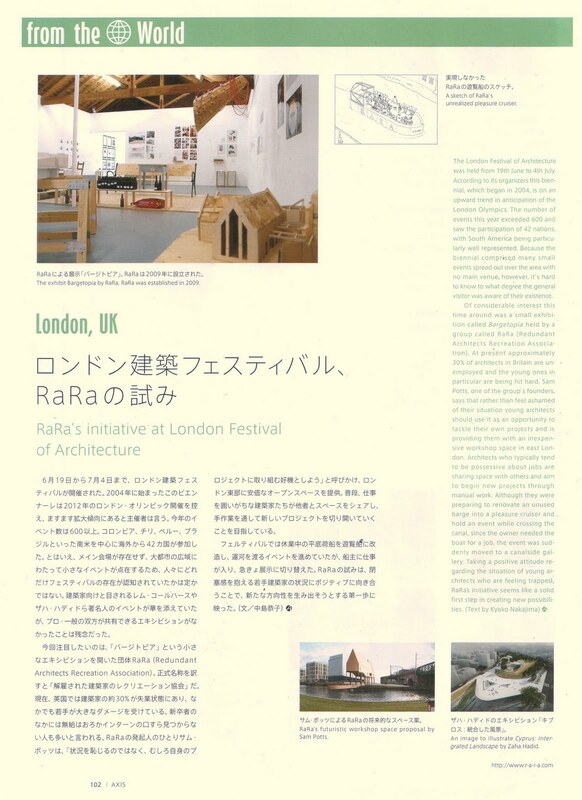 Article about RARA, Assemble and join, and Assemble studios. Joe wins runner up in AR’s GAGA awards for work on RARA. In association with RIBA London, The Redundant Architects Recreation Association (RARA) is celebrating this diamond year of sport by hosting the unofficial Whiff Whaff Olympics. Laure’s Ping Pang Pong project, made at RARA. Axis were particularly interested in Bargetopia as it embodied an endeavour that Japanese culture might be too “ashamed” to embrace – architects openly admitting that times were tough. terrapol.com: Are recessions good for architecture? Hopefully these tough times will help us take a different, more discerning look as to the service our profession is expected to provide to society and produce a much more considerate, honest and exciting design process for the future. Sam Potts, the co-founder of the Redundant Architects Recreation Association (RARA), was one of architecture‘s ‘shining young stars’ writes Alex Scott-Whitby. Article unfortunately paywalled. He went on to co-found Rara in an industrial unit in Clapton, east London, which he described as “an energetic infrastructure designed and built with minimum resources to be as flexible and open to creative use as possible. Article about Once upon a Wartime project, completed by Pippa Nissen studio at RARA. Among those featured are Sophie Teh, a project architect at Van Heyningen & Haward until September last year, who is opening a cake shop, Adrian Welch, founder of e-architect.co.uk, and Sam Potts, creator of the Redundant Architects Recreation Association, which provides affordable work space for architect jobseekers in east London. Sam and Sarah feature in this article about redundant architects. Nice photo of Sam at RARA on the Indy website.